Keeping your swimming pool and its surrounding area well-lit makes it more attractive and a lot safer, but you might not realize all of the different pool lighting options that are out there. These nine popular types of swimming pool lights are some of the most commonly-used, however, so learning a bit more about them will help you make the right decisions for lighting up your pool. The beauty of flush-mounted pool lighting is the fact that they do not stick out further than your pool wall does. They are mounted inside the wall of the pool. Underwater lights that are flush-mounted are becoming much more popular with new pool builds, and LED lights are also rapidly taking over traditional halogen lights. 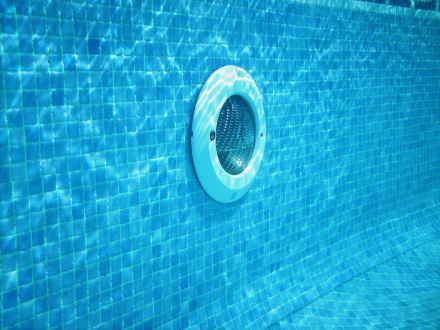 The downside to flush-mounted lights is it can be very costly to install pool lighting that is flush with the wall unless this was allowed for during the construction of the pool. Once again, these pool lights have the advantage of being perfectly in line with your pool wall, but halogen lights use more power and need more maintenance compared to LED options. Installation can be a lot more work with flush-mounted lights. However, halogen lights are significantly cheaper than LED lights so you can save some money here. Surface-mounted underwater lights can be a good option because they will light your pool up without being as difficult to install. They can be easily retro-fitted to upgrade existing pool lights. Since they are not flush with the pool wall, they do stick out a little. Because of this, they are more easily broken, especially if you have children. Children tend to use them as a step to climb out of the pool. A great choice if you’re looking to install underwater lighting but don’t have as much money to spend. These lights have been the standard in underwater pool lighting for many years in Australia. They look great, provide ample lighting and are much cheaper than other choices. 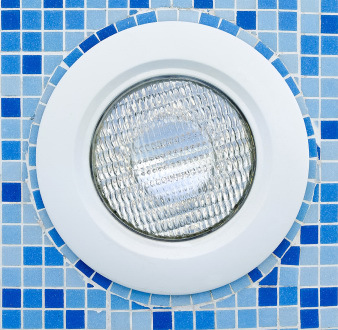 They’re also easier to install than flush-mounted lighting and cheaper than LED pool lights. However, they use much more energy than LEDs. 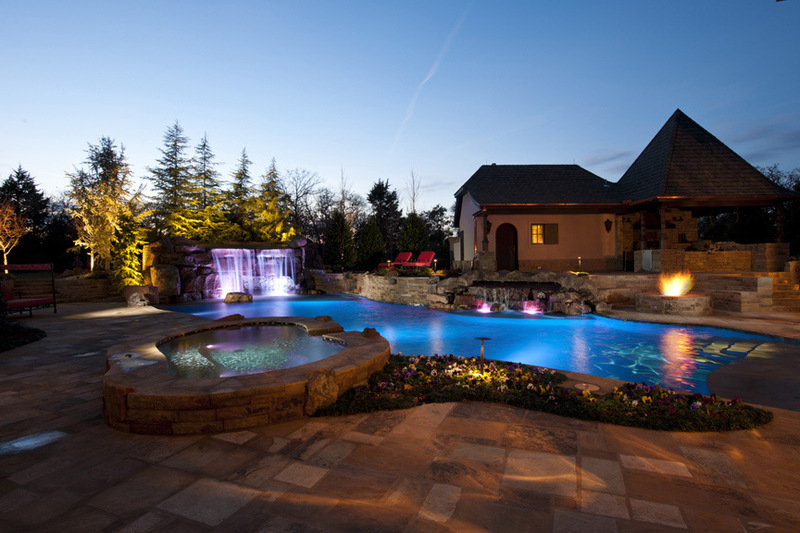 Pool garden lighting is used around the outside of your pool, such as in your landscaping. This lighting is not only practical but when they are properly planned and strategically placed, they can bring your garden to life. You can use flood lighting for just about anything, including around your pool. 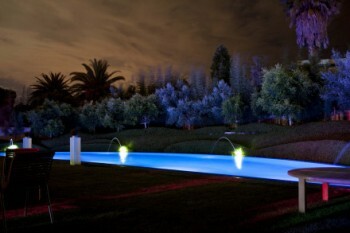 LED flood lighting can be the right choice for your pool area because it will light large areas. LED is much more energy efficient than halogen too. You can pick up what you need to install this type of lighting at your average hardware store without spending a lot of money. You will need to hire am electrician to install it though. Also, you should be careful not to take away the ambiance of your pool area by over illuminating. It’s easy to do with flood lights. Halogen flood lighting carries many of the same benefits as LED flood lighting. It is also easy to install and affordable. However, you will find that it is even more affordable up-front than LED lighting, although it might not carry as many advantages in the long term. When compared with LED flood lighting, halogen flood lighting doesn’t last as long. You’ll also need to regularly change the bulb which isn’t necessary with LED lighting. LED or Halogen lighting can be used to highlight a feature of your pool area or garden. 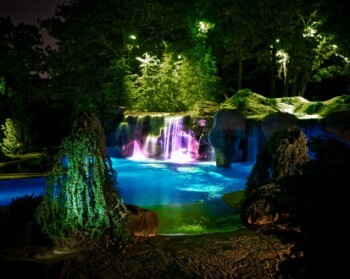 You can opt to light up waterfalls, particular trees or other landscaping features. LED lighting is more cost-effective to run than halogen feature lighting, but you will have to spend a bit more money on it upfront. Perfect for a party, these lights can be used to stunning effect. Normally powered by batteries or even solar power, these lights come in all different shapes, colours and sizes from red lanterns to white lilies. They float either on the surface of the pool or are submersed. As you can see, there are at least nine different types of lighting that you can choose to use to illuminate your swimming pool and its surrounding area. Choosing the right type of lighting can be tough, but looking at the purpose of each light and its pros and cons will help you make the right decision. In the long run, you might choose to mix and match a few different types of lighting to get the most attractive and functional pool lighting for your home. Please feel free to check out our other article for a complete guide to pool lights. Photo Credits: Teaser Photo Attribution: By Caviness Landscape Design, Inc. ; Blog Photo Attribution: By Caviness Landscape Design, Inc. ; Blog Photo Attribution: By stephen jones ; Blog Photo Attribution: By Judit Klein ; Blog Photo Attribution: By Caviness Landscape Design, Inc.